The board had previously recommended cancelling the contract and letting the state executive ethics commission render an opinion based on Cerner’s complaint that its bid was lower, that it wasn’t allowed to demonstrate its product, and that the selection involvement of Impact Advisors created a conflict of interest since that consulting firm also offers Epic implementation and staffing assistance. The procurement board realized that Epic had not been offered a chance to request its own hearing, and after listening to arguments from both companies, declined to pursue the matter further and will let the contract stand. UIC executives said when Cerner filed its protest in December 2017 that it has had problems with Cerner as a current customer, that it has failed twice in trying to roll out Cerner ambulatory due to Cerner-admitted performance problems, and that Cerner failed its technical review and was therefore excluded from demonstrating per state procurement law. UIC’s Epic project will replace systems from Cerner and Allscripts. From Norway José: “Re: Cerner in central Norway. It seems they’ve pulled out, assuming the translation is correct. Wonder if this is a sign of things to come as they turn their attention and resources to the VA?” The Health Center Norway RHF article says that Epic will get the contract after Cerner pulls out for unstated reasons. From You Don’t Need a Weatherman: “Re: referrals. Interesting timing in light of the Steward case.” A case before the US Supreme Court regarding how antitrust laws are enforced may change how courts look at anti-steering provisions. The case involves credit card companies, but if the Supreme Court upholds a lower court’s decision, hospitals and insurers would be allowed to include anti-referral rules in their contracts. The AMA argues that physicians would be unable to send patients to out-of-network specialists even when they believe it’s in the patient’s best interest. From PitVIper: “Re: provider data. 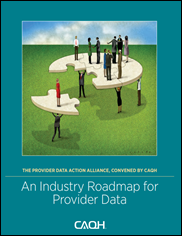 Humana, Aetna, UnitedHealthcare, ONC, SureScripts, VA, and other organizations got together and defined an industry roadmap to address issues in provider data.” A CAQH-convened group develops “An Industry Roadmap for Provider Data” in hopes of reducing the inefficiency created by inaccurate provider data. The groups involved will declare a commitment to the vision, form a governance structure, define an initial dataset and standards, engage regulators, and begin measuring impact. 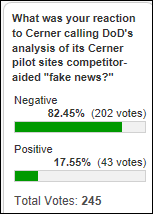 More than 80 percent of poll respondents had a negative reaction to Cerner President Zane Burke’s labeling the DoD’s negative internal report on the MHS Genesis pilot sites as “fake news” that was influenced by an unnamed competitor in unnamed ways. New poll to your right or here: who is most responsible for high US healthcare costs? Next week I’ll compare the new results from the same poll I ran a couple of years ago. I received too few entries to last week’s question, so here’s one last try. I should note that I’m not looking only for negative answers with these questions even those are often in the majority. Welcome to new HIStalk Platinum Sponsor Ciox Health. The Alpharetta, GA-based company facilities and manages the movement of health information with the industry’s broadest provider network, deploying capabilities in release of information, record retrieval, health information management, audit management, coding services and education, imaging services, clinical abstraction, and oncology data management. The company has 40 years of HIM experience and provides services to 60 percent of US hospitals, 16,000 physician practices, and 100 health plans. It manages 40 million requests for health information each year and complies with rigorous standards to ensure privacy and security. 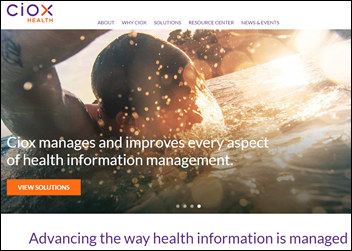 The company manages health information to support continuity of care, patient access to data, and reimbursement improvement. Thanks to Ciox Health for supporting HIStalk. Here’s a Ciox Health intro video I found on YouTube. I paid $65 to run the HIStalk email list through a third-party email validation tool that performs a deep dive into each subscriber’s email service. No wonder people say they aren’t getting my emails – a big chunk of company servers don’t let them through because of anti-spam systems, incorrectly configured servers, and readers who entered their email address wrong. At least I feel better telling people that the problem is on their end, not mine. 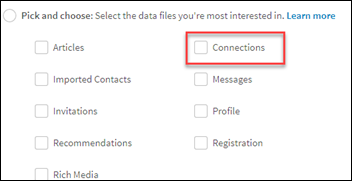 I also learned this by accident – if you export your LinkedIn connections from the Privacy menu, you’ll get an Excel file that includes every one of your contacts along with their job title, employer, email address, and connection date. Thanks to the long-time readers who sent nice thoughts about HIStalk’s 15th birthday, some of whom were reading way back in my first lonely, fumbling year of 2003 (it’s still lonely and fumbling, but I accept it more readily). Listening: new from Black Thought, aka Tariq Trotter, the genius co-founder and performer of The Roots. The lyrics are simultaneously angry, crude, and poetic: “Picture my daughter drinkin’ water with a sign; say ‘for colored girls,’ I ain’t talkin’ Ntozake Shange; Who said it’s cynical? I was a king and general; Rich in every resource, precious metal and mineral; Before the devil entered the land of the plentiful.” Lyrics are undervalued now that music is dominated by good looks, slick dance moves, and computer-enhanced songs written by someone other than the singer, but check out his freestyle rap from December to hear what Shakespeare might sound like if he were born 46 years ago in Philadelphia to parents who were separately murdered by the time he was 16. I just finished reading the Theranos book “Bad Blood: Secrets and Lies in a Silicon Valley Startup.” Book report to follow. Boulder Community Hospital (CO) chooses Epic. Cumberland Memorial Hospital (WI) will replace Evident with Athenahealth on August 1. Caldwell Memorial Hospital (LA) switched from Healthland to Evident in September 2017. Faulkton Area Medical Center (SD) will replace Healthland with Cerner on June 25. Curt Thornton (Capsule) joins Quantros as SVP of sales. Intelligent Medical Objects hires Ann Barnes (MedData) as CEO. She replaces co-founder Frank Naeymi-Rad, PhD, MS, MBA, who will continue as board chair and will add the role of chief innovator. Amazon Web Services announces GA of Amazon Neptune, a graph database that allows developers to query relationships to power social networks, recommendation engines, fraud detection, and drug discovery. A life sciences startup is using it to study disease by connecting genomics, pathology, neurochemistry, and device and patient clinical data. 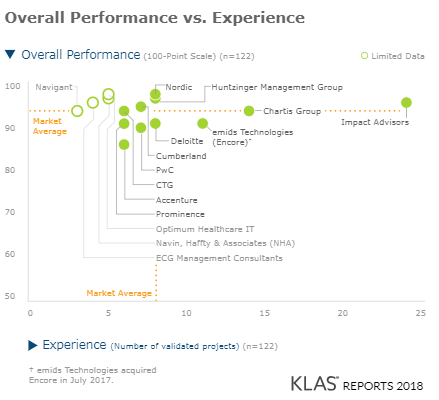 A new KLAS report on HIT assessment and strategic planning finds that Cumberland and EMids Technologies (the former Encore Health Resources) are more consistent in exceeding client expectations; Impact Advisors and Chartis Groups excel at delivering high-quality outcomes across a large number of clients and projects; Nordic is the highest overall performer; and Accenture finishes worst as clients report less value obtained. The report highlights Nordic and Deloitte for thought leadership. A University of Michigan poll finds that half of older adults have set up a patient portal, with those aged 65-80 who haven’t done so saying they aren’t comfortable with technology while those 50-64 say their biggest barrier is that they just haven’t bothered. 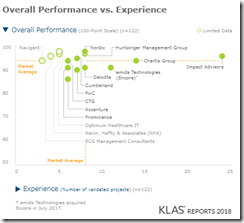 Respondents gave portals a slight edge in their ability to understand the information they’re given, but telephone contact with the practice won for the ability to explain what they need and also with the hope of getting a faster response. 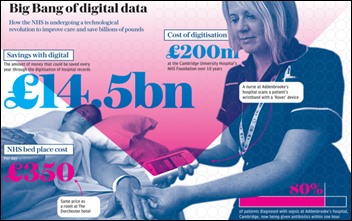 In England, The Daily Telegraph looks at the digital revolution in healthcare, giving kudos to Epic-powered alerts for quickly detecting and treating sepsis at Cambridge University Hospital’s NHS Foundation Trust, where 80 percent of newly diagnosed sepsis patients are being given antibiotics within one hour. It also mentions the Pediatric Early Warning Score for escalating peds issues quickly. The article also quotes Eric Topol, MD, who is reviewing an NHS technology review and who predicts the end of expensive “hotel hospitals” as patients are increasingly monitored at home. A small poll finds that 88 percent of Americans aged 40 and over would be comfortable receiving care via telemedicine, although half worry that care could be of lower quality. A tiny new study finds that doctors can predict which patients will do well on chemotherapy by looking at activity data from their fitness trackers. Those who are non-sedentary more than 60 hours per week seem to require fewer hospitalizations and ED visits. Newly published research finds that many cancer patients could safely skip chemo and surgery without affecting their survival, including eliminating chemotherapy after surgery for early-stage breast cancer. Baylor St. Luke’s Medical Center (TX) temporarily suspends its heart transplant program following publication of investigative reports calling out patient deaths and surgeon turnover. 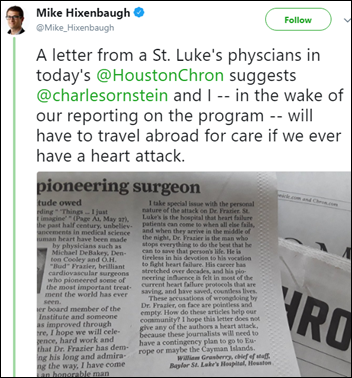 Meanwhile, the hospital’s chief of staff says in a Houston Chronicle opinion piece that “these journalists will need to have a contingency plan to go to Europe or maybe the Cayman Islands” if they need cardiac care after the authors noted the high death rates of heart surgeon Bud Frazier, MD even though the hospital itself had found problems with his work years ago. Apple announces Digital Health, which despite the name, is an app to help consumers wean themselves off their electronic devices by limiting their time online. Google has introduced a similar feature in its Android operating system that records the time spent within each app and allows the user to set time limits. In France, two doctors face disciplinary action after getting into a fistfight in an OR after an anesthesiologist complains about having to work after 4:00 p.m. because the urologist’s case ran over. The anesthesiologist says the urologist threw a bottle of Betadine in his face, with the latter then going after the urologist with surgical scissors. They continued their fracas in the OR dressing room afterward, when the urologist is alleged to have smacked the anesthesiologist in the face with his computer bag, shattering his eye socket and requiring a month-long recovery. 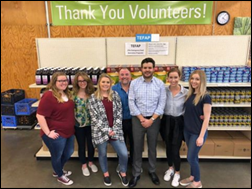 Pivot Point Consulting’s Seattle team volunteers at the Hopelink food bank. Netsmart will exhibit at the NAPHSIS – Vital Records Annual Conference June 4 in Miami. Datica lists its milestones attained as it reaches its fifth anniversary. Clinical Computer Systems, developer of the Obix Perinatal Data System, will exhibit at the Epic Michigan User Group Conference June 5 in Ypsilanti. OmniSys will exhibit at PioneerRx Connect June 7-10 in Nashville. Meditech will host its 5.x/6.0 Revenue Cycle Summit June 26-27 and 6.1/Expanse Revenue Cycle Summit June 28-29, both in Foxborough, MA. Quadramed will exhibit at the CHIA Convention and Exhibit June 3-6 in San Diego. Wisconsin Health News features Redox CEO Luke Bonney. WebPT announces the speaker lineup for its annual Ascend Summit September 28-29 in Phoenix, AZ. Access joins Athenahealth’s More Disruption Please program. ZappRx achieves HITRUST CSF Certification. The SSI Group earns certification under the HHS Optimization Program Pilot of Administrative Simplification. I reviewed the report and found it curious that not a single MD was involved in the report on provider data by CAQH? It’s a question of incentives. Although it’s the providers’ data, it’s the payers that stand to gain or lose the most with tracking credentialing for their respective health plans, maintaining accurate provider directories, etc. Interesting that the survey on portal use doesn’t mention communication with physicians and their offices or paying balances due on office visit. Along with getting test results and scheduling appointments, these are the four main uses of athena’s Patient Portal. 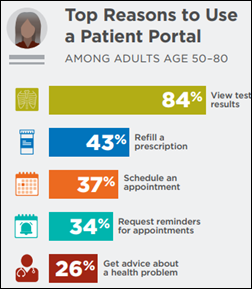 Maybe not surprising that patients don’t think of paying their bills as a preferred use of the portal. And despite an increasing openness to multiple modes of communication with patients, many doctors still prefer to stay off email with their patients. It sounds like the email validation tool you mentioned provided some worthwhile insight – could you please share its name? Thanks. It predicts the likelihood of a given email getting through based on email server settings, but another challenge is that bulk emails (newsletters and the HIStalk email updates, for example) are rejected at a higher rate (or sent to the inbox’s spam folder) as detected by included links and images as well as the sending service used. That outcome can sometimes be reversed by the user adding the sending email address to his or her contacts. The frustrating aspect is that even though the recipient explicitly signed up to receive updates, their mailserver flatly rejects those emails. Can’t tell you how much I enjoy reading your news each week!